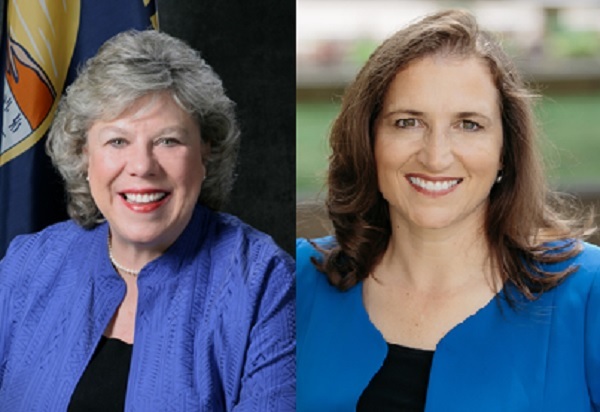 The New Year will bring new elections leadership in several states (with Maggie Toulouse Oliver already in place in New Mexico), but before the new bosses take office, we sat down with two departing secretaries of state Montana’s Linda McCulloch and West Virginia’s Natalie Tennant. McCulloch and Tennant were both elected the secretary of state’s office in their respective states in 2008 and both were re-elected in 2012. McCulloch was term-limited and could not seek re-election in 2016 and Tennant was defeated for a third term. Both women were pioneers in very different ways. McCulloch was the first, and will remain for now, the only woman to ever hold the secretary of state’s office in Montana. Tennant because the first and one of only two women to serve as the school mascot for West Virginia University which garnered her national news coverage in 1990. Tennant and McCulloch were both active on the national stage in the field of elections and both of them saw the implementation of numerous elections-related measures in their states during their tenure. While we look forward to working with their successors, electionline will miss both McCulloch and Tennant who have always been responsive and open and true advocates for elections. Linda McCulloch was first elected to the secretary of state’s office in November 2008 and subsequently re-elected in 2012. She was the first and will remain for now the only woman to serve in the role of secretary of state in Montana. Before becoming secretary she was a senior member of the State Board of Land Commissioners, served as Superintendent of Public Instruction, served three terms in Montana House of Representatives and was on the faculty of the University of Montana. I have loved being Secretary of State! I enjoy the work, the staff and the 56 County Election Administrators who do a great job conducting elections. The biggest change has probably been the huge increase in the use of technology for voting and elections. I implemented an electronic election results reporting system in 2010 that has been widely acclaimed for its broad and varied information about the candidates and ballot issues. We have updated it every election and I think the 2016 update was the best. At least that’s what the public has said. I also started an Electronic Absentee System for military voters. We have increased military voting and have hundreds of comments from service men and women that this has been the first time they are able to vote and know their vote counted. I can honestly say there hasn’t been anything difficult in the office. What has been frustrating is the legislature’s inability to pass Online Voter Registration for the past three Sessions. They pay taxes online, shop online and do banking online, but are reluctant to pass OVR, the safest and most efficient way to register to vote. What do feel was your greatest accomplishment and why? I’ve implemented a lot of things that I am very proud of in my eight years as Secretary of State. A few examples are a new, modern system for our business services filings, and processes and systems that have allowed greater access for all qualified voters, like an electronic system for military voters and an electronic system for voters with disabilities, and an online system and app for voters to track their absentee ballot, find their polling place and view a sample ballot. My first year in office I implemented a post-election audit that has increased transparency in our election process. Additionally, I’m immensely proud to be ranked twelfth in election administration policy and performance nationwide by the PEW Election Performance Index. Is there anything you still hope to accomplish as secretary before leaving office? I plan to leave the office in great shape; all policies up to date, all work up to date and legislation introduced for the session that begins January 2, 2017. I will miss it all—the work, the staff, the customers, the Land Board, and the County Election Administrators. I see more technological advances for both the administration of elections, and for the voters. Things like automatic and online voter registration that create efficiencies and improve accuracy, and more streamlining of the administration of elections through use of electronic poll books and modern voting systems. I am moving back to my hometown of Missoula, Montana and hope to do some observing of elections. Beyond that I am wide open! Get to know your staff and the work of the SOS office before making any changes. Trust your staff, they are the experts. Rely on the County Election Administrators, they know what they are doing and do it well. Natalie Tennant was first elected to the secretary of state office in 2008 and re-elected in 2012. She was defeated for a third term by Republican Mac Warner. While things went smoothly in West Virginia on Election Day, obviously things didn’t go how you had anticipated. How do you feel about your time in office coming to an end? Obviously I am disappointed that my time as West Virginia Secretary of State is coming to an end. There were so many more things I wanted to do over the next four years in terms of cutting-edge technology, really polishing and honing ideas like online ballot delivery, continuing to promote our online businesses services, and enhancing our business portal for businesses in West Virginia. So, it is disappointing. And this transition has obviously been a challenging time, but I am proud of what we’ve done for the incoming administration. I vowed that I would allow someone coming in after me to have a proper transition because I did not receive a proper transition period when I came in. We have been professional, consistent and transparent. I have appointed one person to be our point person for the transition and she has been professional, while knowing she was training a person who would be taking her job. But I look at this transition the same way as we’ve conducted ourselves over the last eight years — it was always about the people of West Virginia and offering excellent customer service while giving forward-thinking ideas and initiatives that led the country. In my tenure as Secretary of State there have been many big changes in elections. We were the first in the country to have an online pilot project for internet voting for deployed military and overseas citizens. It was a successful pilot project that was safe and secure, and accepted and appreciated by our deployed military. Even though it is not continuing, it has given the elections industry an opportunity to have discussions and debates about what we can do online. I’m proud to say that West Virginia led the way in that during my administration. The pilot project led to online ballot delivery for our deployed military members. I see this method and process as a way that we can expand and enhance access, perhaps for veterans who may be at a VA hospital or as a way for disabled American veterans to be able to receive their ballot. Then we can continue that and grow it to college students who are living out of state or away from their home county. And then, of course, online voter registration has made a huge impact in West Virginia and that has set the foundation for automatic voter registration because of the forward-thinking in the process is that we put in place. In some cases, what was a difficult time was convincing other people of how important modernizing elections is. And it was in convincing some county clerks, not all of them, how important it is and how the people of West Virginia and of this country deserve to have the most modern process and the easiest accessibility. And I found that during the online voter registration process that there were a few county clerks who did not want to implement it. Online voter registration is almost passé because every state in the country is going to have it over the next couple of years and it shouldn’t have taken such struggle to convince a few county clerks how important it was and how much voters deserve it. I don’t have one initiative that is my greatest accomplishment. We have pushed forward and accomplished so many things. Whether it’s in the elections division with pilot program for online voting with our military, online ballot delivery, online voter registration or our automatic voter registration. It is all of the accomplishments together that make the greatest accomplishment for the office. Because the greatest accomplishment comes in the fact that the employees believed in what I was saying, believed in my vision and believed that they could accomplish what I had expected of them. That’s what is an accomplishment for me. That I had developed employees who come back to me and said I think we can do this or I think this is a great idea or I’ve been asked to sit on a national panel of experts because of what we’re doing in West Virginia. That’s the accomplishment that I see. I will miss everything about being Secretary of State. I will miss the challenges. I will miss the opportunities to work with a group of very smart, dedicated and willing individuals in the Secretary of State’s office. I will miss seeing citizens of West Virginia who I know that we’ve helped because we took risks and tried services and processes that ended up benefiting West Virginians. As an expert in the field of elections, I see the administration of elections continuing to move forward. As states continue to embrace online voter registration and automatic voter registration they need to see that this is important for the voters. And they will have to be administrators and Secretaries of State who will continue to push forward and say that these important processes are not allowed to sit stagnant. Voters deserve to have modernized elections. We have modernization all around us in our daily lives and elections should not be any different. I love to get up early on Election Day and help wake up the citizens of West Virginia and the voters with live television interviews and really show that it’s an exciting day to be a part of. I am looking into opportunities where I am able to use my election experience and my executive-level expertise to continue to create forward-thinking initiatives that will help West Virginians and this country. I would suggest to my successor that he continue on the initiatives that we’ve started here in the Secretary of State’s office. I believe that he should honor and respect those individuals who work in this office who have been a huge part of making positive changes. I think that facts are very important — being truthful, honest and transparent should be paramount in state government and that can come from the top. I will add my words of appreciation for the work of both Secretary McCulloch and Secretary Tennant. I suspect (without knowing, no scoops here!) that we may well be hearing from both of them again eventually if not soon. Thanks as always to my friend Mindy for sharing these stories. With that, my blogging for 2016 comes to an end (whew – what a year); no posts for two weeks as I celebrate the holidays with my family and travel to start the New Year. Thank you for another year of support and readership – see you back here on January 9, 2017 … and STAY TUNED! Next: Blogging Break … See You Next Year! 1 Comment on "electionlineWeekly “Exit Interviews” with MT’s Linda McCulloch and WV’s Natalie Tennant"
ElectionlineWeekly “Exit Interviews” With MT’s Linda McCulloch And WV’s Natalie Tennant. Among the various types of technology Fit this post. So I agreed.